Data is from the January 2019 OnBrand and Bynder "State of Branding Report 2019." 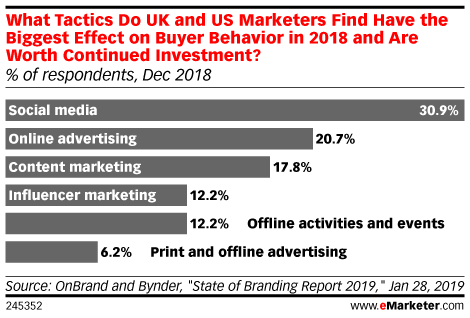 501 UK and US marketing decision-makers from various industries were surveyed during November 28-December 11, 2018. Respondents identified their role as sharing decision-making responsibility (54.3%) and sole decision-maker (45.7%) and are from companies that are primarily focused on B2B (17.2%), B2C (39.7%), both (25.7%) or non-profit/government (16.8%) with number of employees at their company as 501-1,000 (25.5%), 1,001-5,000 (34.5%), 5,001-10,000 (21.4%) and 10,000+ (18.6%). OnBrand is a branding magazine. Bynder is a digital asset management company.